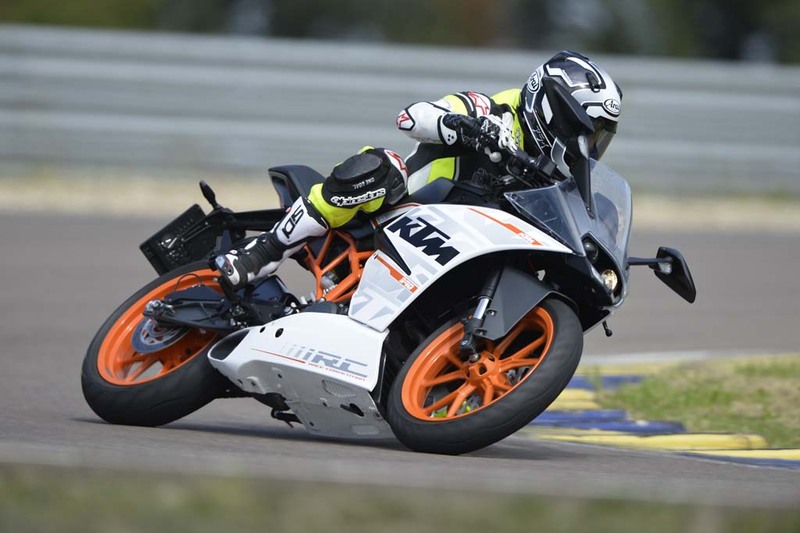 There is nothing else quite like KTM’s new RC390. Sure, there are some sporty motorcycles displacing less than 500cc, but none of them are as sharply edged or as exotically styled as the RC390. America’s bigger-is-better mentality doesn’t usually give much credence to a single-cylinder sportbike, but the RC390 has the visual appeal and sporting cred that may change some minds. KTM has been on a streetbike roll lately. It earned MOBO awards in 2014 for the stellar 1190 Adventure and the astounding 1290 Super Duke R, our Motorcycle of the Year. The Austrian company’s latest push as a purveyor of more than just excellent off-road products is the RC390. The RC390 follows single-cylinder Dukes in 125cc, 200cc and 375cc and their corresponding RC models, all of which have already enjoyed success in world markets such as Europe and Asia. And also in India, where they are built under the umbrella of Bajaj, which owns a minority share of KTM. More than 30,000 of the 125/200/390 models have been sold in the past 12 months, which is a really impressive number of street motorcycles for the formerly dirt-oriented KTM. These contributed to a 28% increase in sales over the past six months (70,500 units), and June 2014 was the best month of sales in the company’s history. 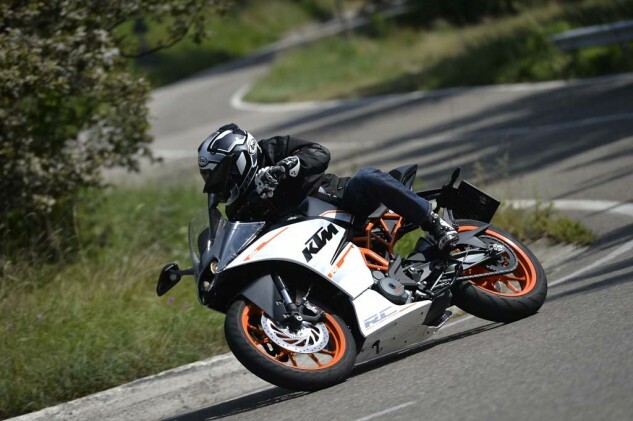 Streetbikes now account for 50% of KTM’s revenues. The RC390s stylish appearance looks exotically appealing for a motorcycle expected to be priced less than $7,000. 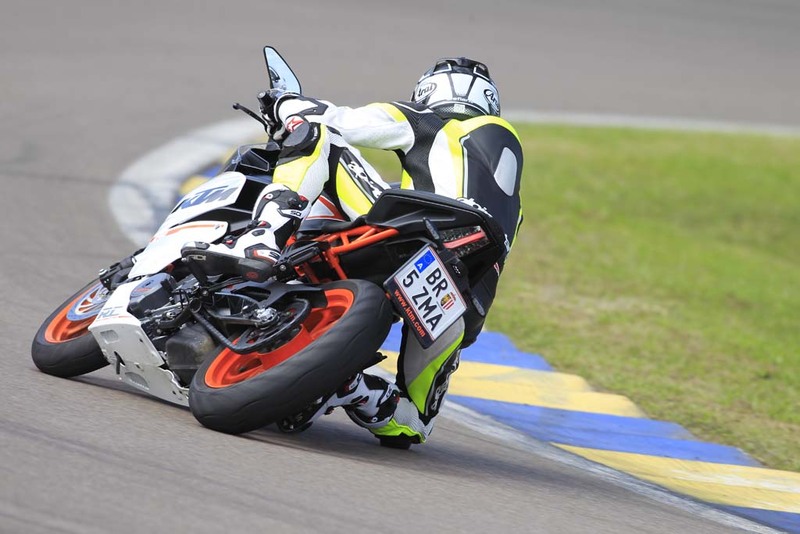 Fast fact: The fork’s forged-aluminum triples and axle clamps, and the Metzeler Sportec M5 tires, are the only components of the RC390 not manufactured in India. 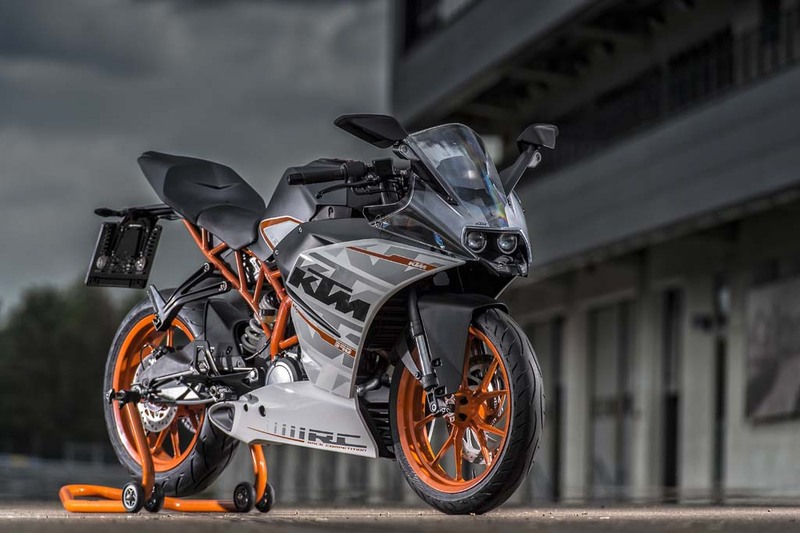 KTM’s India operations will soon be sending motorcycles to the North American market, with the 390 Duke and RC390 scheduled to hit our shores by March 2015. The RC is our focus here. We just returned from the bike’s world media launch, spending a morning riding urban streets and hills in Italy’s famous motor region (home to Ferrari, Lamborghini and Maserati), followed by an afternoon lapping the Autodromo di Modena circuit, where the RC demonstrated sporting bona fides beyond class rivals like Kawasaki’s twin-cylinder Ninja 300 or Honda’s single-cylinder CBR300R, or even Honda’s parallel-Twin CBR500R. Motivating the RC390 is a fuel-injected 373cc Thumper boasting premium-level equipment like a forged aluminum piston and DLC-coated finger followers for its twin-cam valvetrain. An oversquare 89mm x 60mm bore and stroke allows the engine to spin just past 10,000 rpm. The RC390’s liquid-cooled Single uses a stacked transmission layout to keep the wheelbase short while having a desirably long aluminum swingarm. Powdercoated tubular-steel trellis frame looks way sexier than the chassis of any other beginner-friendly sportbike. Robots do nice welding. 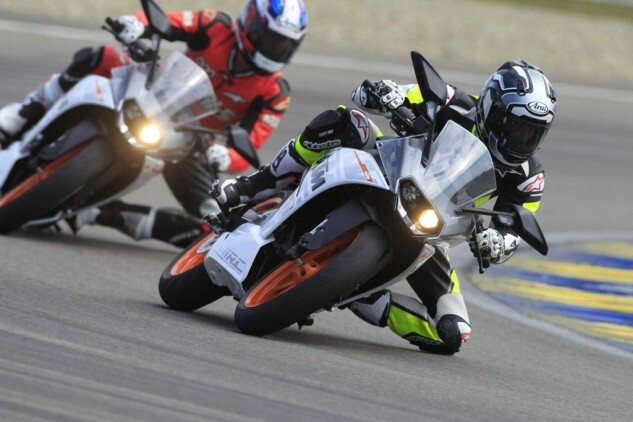 The RC390 (and its Duke brother) are designed to push the limits of Europe’s A2 licensing system that restricts young riders (ages 18 to 20) to bikes with a maximum of 0.2 kilowatt of power per kilogram. 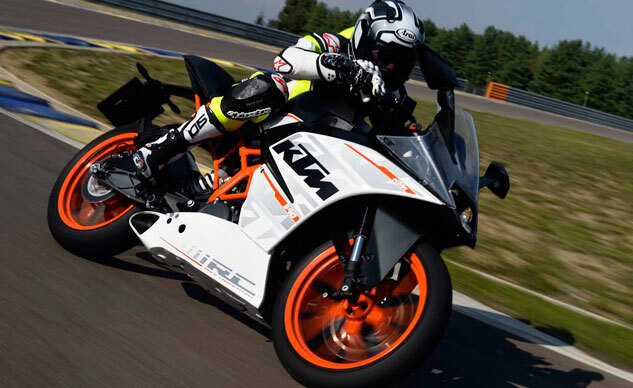 Translated for the non-metricfied: The RC390’s engine is rated at 32 kW, which converts to 43 of our horsepower. Given a 10% reduction in power when measured through the RC’s six-speed driveline, we’d expect to see almost 40 rear-wheel hp. KTM says the bike weighs 324 lbs without any fuel in its 2.6-gallon tank, yielding about 7.5 pounds for each peak pony to pull. Big dudes need not fear the RC390. It has a shocking amount of legroom for a small-displacement sportbike. A 32.3-inch seat height combine with fairly low-mounted footpegs to be tolerable for legs of six-foot humans. Handlebars are located at the same level as the upper triple-clamp, providing a reach forward a bit further than a CBR300 or Ninja 300. Surprisingly for a modern world-market bike, neither hand lever is adjustable for reach. Duke, at 5-foot-8, fits the RC390 well, but a 6-foot-3 rider at the launch said he also felt comfortable with the ergonomics. Note how the stainless steel exhaust system is almost totally hidden inside the bellypan bodywork. A modest clutch pull and smooth modulation makes for easy getaways, aided by a good supply of low-end grunt from the injected motor, which is more plentiful than from a CBR300 or Ninja 300. Short gears click off quickly in the buttery-smooth transmission that nicely tolerates clutchless upshifts. Somewhere in the middle revs is a brief flat spot, but the small bar-graph tach and its tiny numerals made it impossible to discern exactly where. 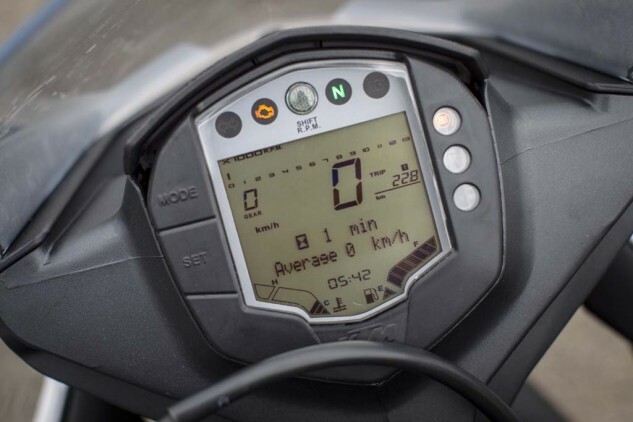 The digital instrumentation was otherwise pleasing, as it includes fuel economy info, a fuel gauge, temperature levels, a gear-position indicator and a programmable shift light. Mirrors are amply wide but are bisected by a rider’s forearms. Kudos to KTM for a lot of info in its digital gauges, but the tach (at the top) is too small to be useful. Bump-absorption duties are handled by KTM’s subsidiary, WP Suspension, these units manufactured in India. The fork is a stout 43mm unit, the same diameter as used on the RC8R superbike, while the rear is held up by a monoshock actuated by an aluminum swingarm. They proved to be surprisingly compliant over the many uneven road surfaces we encountered. Adjustments are limited to only spring preload via a ramped collar on the shock. 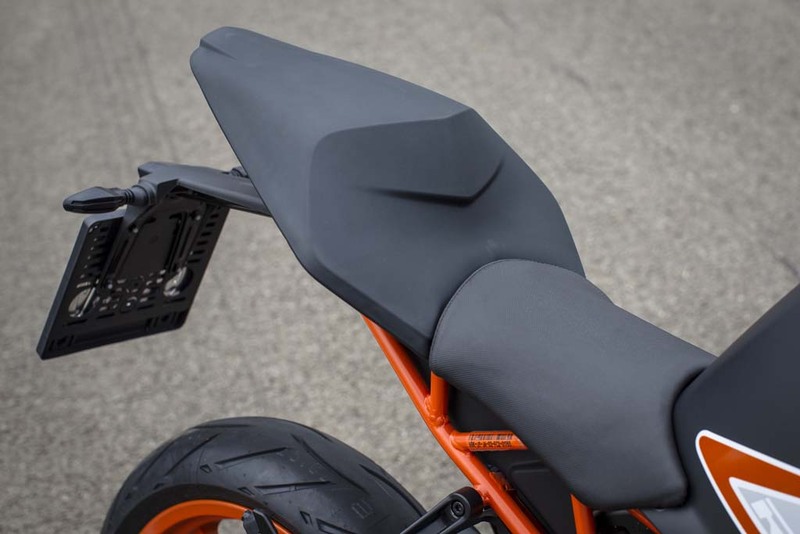 What looks like a matte-black tailsection is actually a pillion seat made of a Canadian-sourced material that is the first time ever used on a motorcycle. Grab handles are nicely integrated beneath. Brake hardware is superior to the RC’s small-displacement contenders, using steel-braided lines to actuate a four-piston radial-mount caliper biting on a 300mm rotor up front. The caliper is a ByBre unit, which is a Brembo-engineered piece that is manufactured in India. The rear disc is a 230mm unit clamped by a single-piston caliper. Bosch 9MB two-channel ABS is standard equipment and can be switched off if desired. 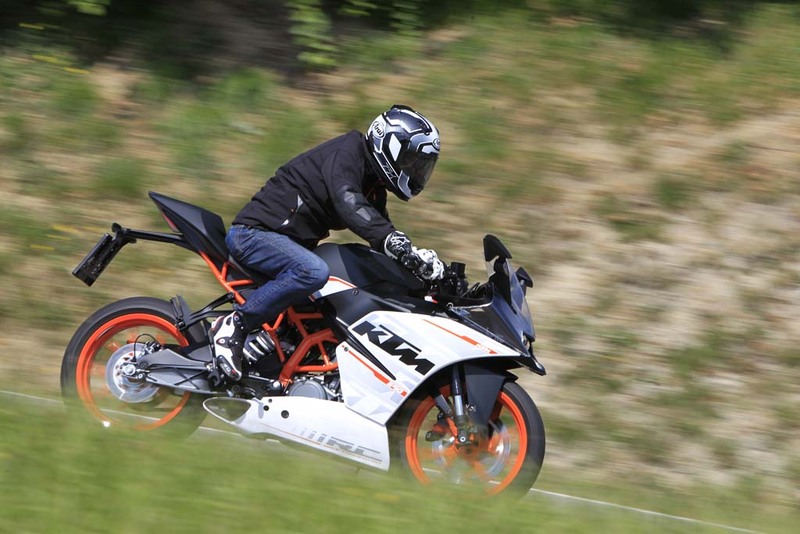 The binders were designed, says KTM, to provide a wide range of modulation to suit the varying levels of braking required in street situations. Initially, their power felt disappointing because of a soft initial bite but then became commendable once accustomed to pulling the lever through considerable travel. The roads opened up at a couple of points on our street ride, and we were pleased to see the speedo click past 100 mph – the magic “ton” – to an indicated 103 mph. In fact, highway cruising is fairly tolerable, at least in terms of engine capability. A balance shaft knocks out harsh vibration, and there’s a decent amount of passing power. A sixth-gear roll-on from 70 to 80 mph took only about 3 seconds flat. Nothing proves a motorcycle’s sporting creds better than a racetrack, and KTM booked the perfect one for exploring the performance envelope of the RC390. Autodromo di Modena is a technically demanding 1.5-mile circuit with a variety of corners coming one after the other. While our morning testing proved the RC390’s street competence, the track environment brought out the bike’s ultimate grin potential. Okay, so you won’t have the joy of fighting power wheelies, but the search for knocking off tenths of a second in lap times is otherwise as pleasurable as on much faster, and more expensive, sportbikes. Do not think that dicing with your buddies on a 40-horse sportbike can’t be riotously fun! Rich dudes will be able to buy at least four RC390s for the price of a Panigale R.
The little KTM gleefully attacks every corner, with its light weight allowing instant direction changes, while its stiff chassis remains nicely planted and confidence inspiring even during aggressive maneuvers. Ultimate corner speeds are limited by footpeg clearance, but that’s typical for this class of bikes. Rear-set pegs are available from KTM’s Power Parts catalog. The suspension that seemed almost too compliant on the street holds up remarkably well on the track. The brakes tell a similar story. Although lacking the millimeter accuracy of top-shelf binders, the ByBre units delivered precise amounts of braking and never faded. The threshold of ABS intervention is quite high, as they only activated a few times at the track while braking over bumps. Holding down a button down on the gauges switches off ABS, if that’s your preference. Another high-end touch on the RC390 is its LED position lamps below the projector-beam headlights. LEDs are also used for minimalist turnsignal lamps, the front ones almost unnoticeable in the mirror stalks. The RC’s motor has a strong and wide powerband relative to its peers, even if your arm sockets are safe from being yanked hard. Maximum torque (25.8 ft-lb) is said to arrive at 7250 rpm, so you’ll want to keep the Thumper spinning high. Peak horsepower is reached at 9500 rpm, delivering a nice lunge when revved out up top. Wringing its neck resulted in speeds approaching 100 mph at the end of the track’s longest straightaway. It’s worth reiterating how much of a gigglefest it is to hammer a low-powered but lightweight sportbike around a racetrack, even for riders with decades of experience riding big-horsepower bikes. 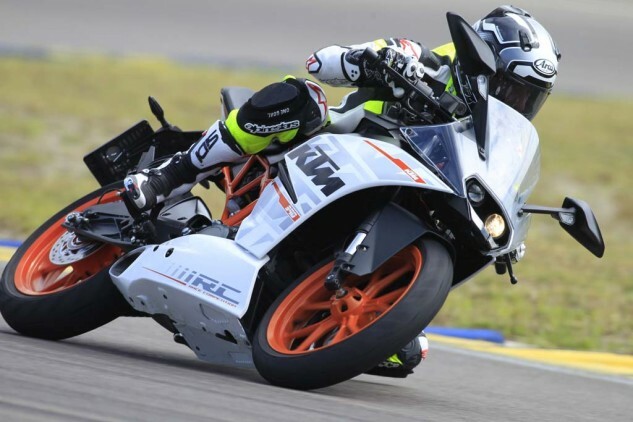 And for those who might be taking to the track for the first time, a sporting motorcycle like the RC390 is a perfect tool to learn how to do it properly. The RC390 can teach everything there is to be learned about riding quickly on a racetrack, without the intimidation factor and higher costs of more powerful machines. The RC’s powertrain isn’t totally without flaws. Along with the aforementioned brief midrange flat spot, gearshifts from third to fourth were occasionally not cleanly engaged if rushed. Otherwise, the KTM’s powerplant is superior to any sub-400cc competitor. Based on the amount of fun and thrills obtained during our Italian ride, the RC390 seems poised to be a big worldwide hit for KTM. Its exemplary dynamic capabilities make it a must-see alternative for riders considering smaller Ninjas and CBRs. Add in the RC’s stunning appearance, and its competition suddenly looks a bit dated. The RC’s 150/60-17 rear tire is slightly fatter than the 140/70-17s on the CBR and Ninja. Note the teeny LED turnsignals and LED tail lamp. For comparison, the new CBR300R and twin-cylinder Ninja 300 cost $4,899 and $5,299, respectively, when equipped with antilock brakes; they are $500 cheaper without ABS. Consider, too, the relative weights. Subtracting the mass of varying amounts of fuel in different-sized tanks, the CBR (337 lbs) and Ninja (357 lbs) are both heavier than the RC390’s 324 lbs. Swinging the vote further in the KTM’s favor is an engine more powerful than its rivals. It boasts considerably more horsepower than than 286cc Honda, and likely a couple of ponies up on the 296cc Kawi. Even more meaningful is the RC’s significantly greater torque production thanks to its 87cc and 77cc displacement edge, respectively. 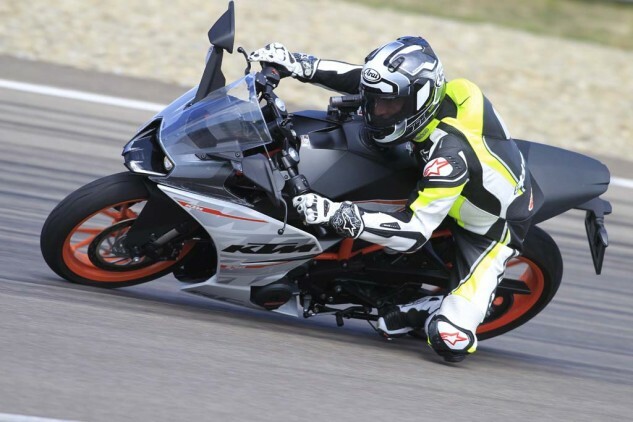 Aside from a an indeterminant price disadvantage, the RC390’s drawbacks are few. Although KTM’s dealer network has been greatly expanding, it can’t come close to matching the number of Japanese OEM dealers. Also, you’ll probably be visiting your KTM dealer a little more often, as the manufacturer specifies service intervals at 4,700 miles. Valve adjustments are required at 9,300 miles. However, these factors fade away when factoring in the RC390’s performance and desirability indexes. It offers a ton of fun and visual appeal for the dollar. “It’s a responsibility of manufacturers to build motorcycles for younger riders,” said Thomas Kuttruf, KTM’s PR manager, at the RC’s launch. 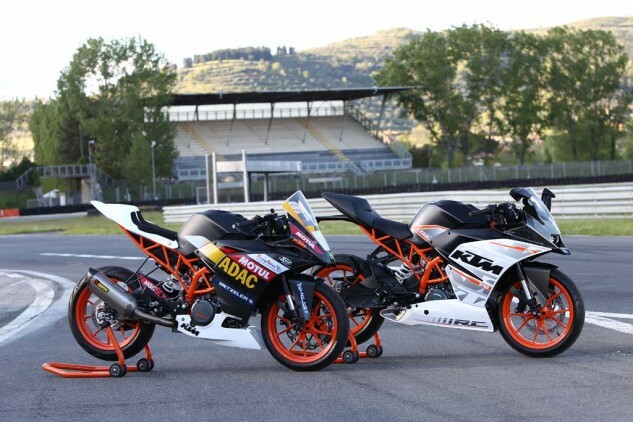 To further these efforts, KTM is sponsoring the ADAC Junior Cup series in Germany already in progress. Intriguingly, the company is investigating being similarly involved in an American series. A full field of identically prepped RC390 racebikes would make a terrific training ground for budding racers while keeping a rein on costs.